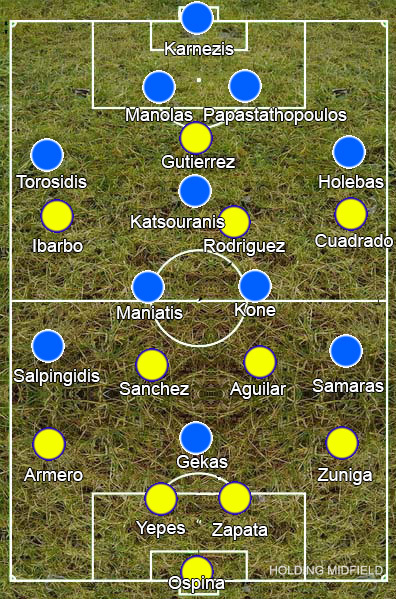 A decade since their shock triumph at Euro 2004, the Greeks are back with another defensively strong side. Eight clean sheets from ten qualifying games, five of which were 1-0 victories, tells a familiar story. A major issue for Greece has been that the European Championship victory put them on the map meaning they are no longer taken for granted, and sneaking into the second round at Euro 2012 may not have helped matters. This makes them probably deserving favourites to finish bottom of the World Cup’s most competitive group. Nevertheless, with their opponents missing star striker Radamel Falcao, Greece must have fancied their chances at keeping Colombia at bay. Fernando Santos set up his team in a 4-3-3 with Theofanis Gekas chosen over Kostas Mitroglou to lead the line, while Jose Pekerman’s side were in a 4-2-3-1 formation with Teofilo Gutierrez the man replacing Falcao. Dreams of a clean sheet evaporated just six minutes in as James Rodriguez dummied a Juan Cuadrado cross for Pablo Armero to finish. The Greeks were very clearly a second slower all over the pitch in these opening stages, late to all of Colombia’s rapid passing exchanges, and, a class above, it was clearly a matter of when rather than whether they would score. Their best work came from Camilo Zuniga, Rodriguez and Cuadrado linking down the right – partly due to their quality and partly due to left-back Jose Holebas being the Greek’s defence’s weak link. Natural right-back Iaonnis Maniatis is usually used on the left of the midfield three to cover Holebas, but instead he was on the right and attacking midfielder Panagiotis Kone was ahead, leaving the left-back exposed. Victor Ibarbo kept Greece stretched with his pace on the opposite flank, but even he started coming over to the right in the second half, while Gutierrez did a simple job up front of laying the ball off with little first-time flicks to his teammates whenever the ball came his way. With the lead, the Colombians were happy to sit back, letting Greece have the ball in front of them as it was seldom that they put together anything resembling a threat over the 90 minutes. Veteran from the 2004 side Kostas Katsouranis would drop between the centre-backs, allowing Holebas and Vasileios Torosidis to motor down the flanks as a long ball was sent forward. The Greek attacks generally came from crosses into the box, with numerous players flooding the penalty area when a ball was sent in to little success. Somewhat surprisingly Georgios Samaras was rarely one of them – you would think the main benefit of playing a 6ft 4 target man out wide would be his ability to win long balls against a typically short full-back, but Samaras fancied himself as a creative midfielder, coming short into midfield and hovering on the edge of the box whenever a ball was sent in. It was a bizarre use of a player who seems to have forgotten how massive he is – used properly he could have easily have offered something to an otherwise miserable attack. That Colombia managed a comfortable win despite barely trying for 84 minutes says all you really need to know about the game.